Routinely descaling your coffee maker allows it to reach its ideal brewing temperature. 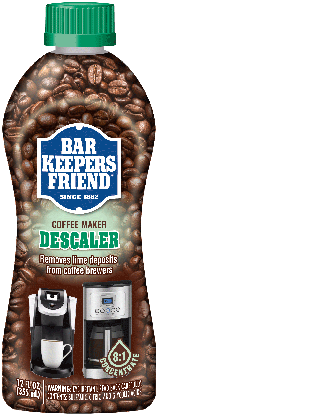 Bar Keepers Friend’s Coffee Maker Descaler removes, dissolves, and destroys temperature-robbing mineral scale from the water reservoir and coils. Reaching the manufacturer’s ideal brewing temperature ensures maximum flavor extraction from your coffee beans. For best results, descale every three months, or according to your brewer’s instruction manual. After you’ve descaled, don’t forget to clean your machine with our Coffee Maker Cleaner, which removes coffee oils and residue. Why isn’t your coffee as hot or as flavorful as usual? Over time, the minerals in your water build up in your coffee maker, causing slower water flow and poor brewing. Mineral scale reduces the temperature and the flow of the water as it goes through your coffee maker, which decreases your coffee’s flavor. Unless you descale your coffee maker, the increased buildup will continue to reduce your coffee maker’s performance, resulting in incomplete brewing, insufficient heating, and mineral deposits affecting the flavor of your beverage. When scale first begins to accumulate, you may notice that the water reservoir in your coffee maker doesn’t fully empty. Additional signs that it’s time to descale your coffee maker include reduced coffee temperature, an “off” flavor, or small flakes floating in the top or resting on the bottom of your coffee pot. In areas with hard water, plan to descale your coffee maker once a month. Coffee drinkers with softer water or whole-house water softening systems may only need to use a coffee maker descaler every few months. For best results, follow the instructions in your machine’s manual, or descale your coffee maker when you begin to notice a drop in performance. Why use a coffee maker descaler rather than a cleaner or vinegar? Bar Keepers Friend specially formulated our Coffee Maker Descaler to remove hard water deposits more effectively without damaging the mechanisms and materials of your coffee maker. Our Coffee Maker Descaler dissolves and removes mineral scale from the water reservoir and coils of your coffee maker with perfectly balanced acidity. Home remedies to descale coffee makers, such as vinegar or vinegar solutions, are often insufficient to fully descale your reservoir and coils. With BKF Coffee Maker Descaler, you get rid of the scale while preserving your machine and its performance. Add one ounce of Bar Keepers Friend Coffee Maker Descaler for every eight ounces of COLD water needed to completely fill the coffee maker’s water reservoir. Do not exceed the maximum fill line for your reservoir. Remove any disposable filters or coffee pods from the coffee maker. Place the empty carafe or cup under the coffee discharge. Initiate the brew cycle, and repeat until the reservoir is completely empty. For coffee makers with a clean cycle, initiate the clean cycle and allow the cycle to run completely. Discard the used Coffee Maker Descaler from the carafe or cup and clean the carafe or cup thoroughly. Fill the coffee maker reservoir with clean, cold water, and run another brewing cycle. Dispose of used rinse water and clean carafe or cup again. Note: Because Bar Keepers Friend Coffee Maker Descaler is acidic, use gloves and protect your eyes while using the product. Immediately rinse splashes or spills from the coffee maker or countertops to avoid damage. Special care should be taken on granite & other stone surface countertops, especially. Always descale your coffee maker with COLD water. Refer to your coffee maker product manual for additional information and instructions. FIRST AID: Keep away from eyes, skin, and clothing. If in eyes, remove any contacts and rinse with water for 15 minutes. Do not ingest. If ingested, do not induce vomiting. Drink 1 to 2 glasses of water and consult a physician. Improve the flavor of your coffee by taking care of your coffee maker. Ask your retailer to carry Bar Keepers Friend Coffee Maker Descaler so you can keep your machine at peak performance.